Technology Associate Professor/Assistant Professor Jobs. For these jobs you can apply within 7 days from the notification date. For more details refer the official website www.git.edu for Professor/Associate Professor/Assistant Professor Jobs recruitment 2019. More details Like Selection Process, Important Dates, Qualification, Salary and e.t.c. Are available given below. 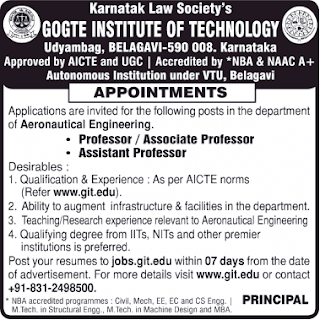 Associate Professor/Assistant Professor Jobs in KLS Gogte Institute of Technology. Starting Date to apply for Professor/Associate Professor/Assistant Professor Jobs: 23-03-2019. Ending Date to apply for Professor/Associate Professor/Assistant Professor Jobs: 31-03-2019.